Have trouble with mold and mildew on your deck, siding, or roof? Are you able to clean the stains, only to have them return again in the fall or spring? If you are tried of always playing catch-up around your home or garden, then try Wet and Forget moss, mold, and mildew stain remover! Not only does it wash away the stains, it leaves a residue on treated surfaces that will prevent regrowth for up to 12 months. How does Wet and Forget for outdoor surfaces work? This blue liquid concentrate is diluted and applied through a pressure sprayer; a simple garden sprayer will do perfect! Saturate the problem surfaces with the product. One gallon of ready-to-use product will cover anywhere between 125 and 375 sq ft (just depends on the porosity of the surfaces). Once applied, Wet and Forget started “eating” away at the stains and killing the live growth. The stains are pulled to the surface, where they are rinsed away by rain and wind. It is important that surfaces are exposed to rain water when used outside. If not, they then it is best to rinse sheltered areas once a week to activate the solution and to remove the stain. Please note, stains take on average about 1-2 months to completely rinse away, however, you will generally see results after just a couple of days (or rainfalls). Just as the name suggests, you simply “wet” and then “forget”. No power washing, no scrubbing, no scraping necessary! Will Wet and Forget prevent stains from coming back? Yes, this is one of the most unique aspects of Wet and Forget. Not only will stains be rinsed away, there is a surfactant in this product and a residue that remains on all treated surfaces. 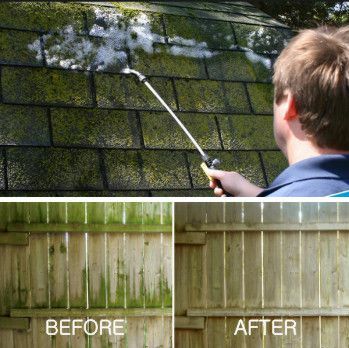 This residue prevents regrowth of moss, mold, mildew, and lichen for up to one year. It is great for hard-to-reach areas such as siding and roofs, and for mold-prone areas such as shaded areas around the home, or other high humidity, poor drainage areas outside. What surfaces can Wet and Forget be applied to? Wet and Forget has very few limitations when it comes to surfaces. You may to almost any outdoor surface including concrete, asphalt, pool surrounds, fiberglass (great for boats! ), brick, painted surfaces, ceramic pots, composite or wooden decks (stained or painted), canvas awnings, gutters, siding (vinyl, aluminum, wood, or stucco), roofs (asphalt, fiberglass, steel, clay, shake, or tile) and so much more. It seems that so many of us have trouble with mold and mildew on exterior surfaces, hence the reason we recommend Wet and Forget so frequently. It is great for removing stains, but equally good for preventing them. During these summer months, consider pretreating problem areas with Wet and Forget so that mold and mildew stains do not form during the fall and early spring of next year. Ideally, if you get in the habit of applying Wet and Forget once a year, you can totally eliminate stains from forming.